The wolf is a symbol for cruelty, cunning and greed in some cultures but others admires it because it represents courage and victory. 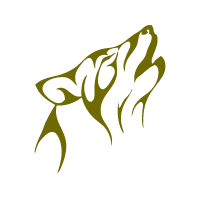 Wolf is a symbol for companion and guardian. In a positive light they are a symbol of loyal, faithful, honesty and willing to fight injustice. It is seen as a powerful symbol of loyalty, intelligence and vigilance. As a descendant from the Asiatic Wolf man’s relationships with wolfs goes back over 40,000 years and then it was the 11th sign of the Zodiac where it represented symbols both positive and negative. In some ancient civilizations the Wolf was a symbol of the underworld. In Egypt, the guardian of the dead was Anubis who was a wolf-headed god. The jackal portrayed as black was the symbol of both death and regeneration. The Wolf’s quality made it associated to a guardian and therefore the protector of souls that entered the underworld. Its ability see well in the dark makes it a symbol of instinctive knowledge and the Greeks, North American Indians and Romans were said to associate Anubis with a star (Sirius) and called it a wolf star. Additionally, in ancient Mexico, the wolf was buried with human sacrifice so that it could guide it to the hereafter while in ancient Scottish legend the green wolf of the faerie world was believed to drive nursing mothers into the hills so as to provide milk for the fairy creatures. In the recent world, a wolf is a beloved human companion and friend because of its fidelity, loyalty, and affection. Despite this some cultures it is considered unclean.